Mollie Doctrow stands in front of her “Pygmy Oak Forest,” one of four woodcuts destined for the ambassador’s residence in Niamey, Niger. AVON PARK — The artwork of Mollie Doctrow, curator of South Florida State College’s Museum of Florida Art and Culture, will soon be seen by people in the Republic of Niger in West Africa as part of the U.S. Department of State’s Art in Embassies program. Four of Doctrow’s woodcuts will be part of an exhibition on display in the residence of Eunice Reddick, United States ambassador to Niger. 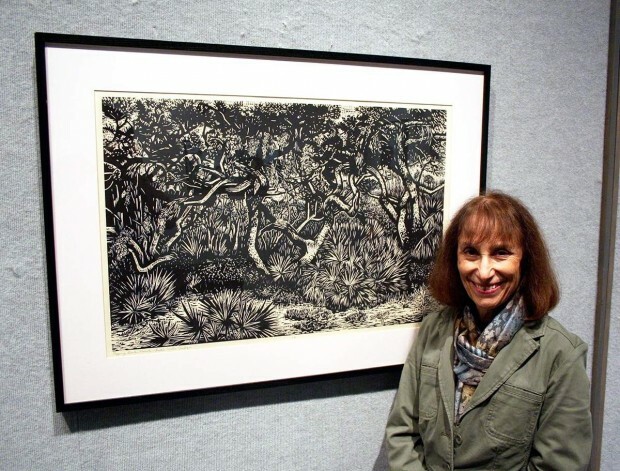 The woodcuts represent native Florida habitat and were selected for the exhibition to represent the Everglades, Highlands Hammock State Park, Archbold Biological Station and central Florida. The artwork will be installed in early 2015 and will remain on display for two-and-a-half to three years. AIE was developed in 1963 under the Kennedy administration to foster positive relations within local communities worldwide. The organization’s professional curators create exhibitions for American embassy residences and permanent collections for American embassies and consulates. Beginning with field sketches of natural places, her drawings are transferred to wood and carved with small gouges. “The carving demands spontaneity, letting go, and following the movement or feeling for the form,” Doctrow said. “The marks become visual shorthand — a way of simplifying complex images.” The carved blocks are then printed on Japanese kozo paper, each print hand-pulled in Doctrow’s studio using an etching press. Doctrow holds a Bachelor of Arts and Master of Arts degrees in printmaking from California State University, Northridge. She has participated in solo and group exhibitions, has lectured widely and conducts workshops on woodcut art. She has held art residencies at Big Cypress National Preserve, Everglades National Park and Archbold Biological Station. These residencies provided access to remote and pristine areas in Florida, inspiring much of her recent work. According to the AIE, the organization engages over 20,000 artists and other individuals globally, from museums, galleries, universities and private collections, and encompasses over 200 venues in 189 countries. For more information, visit http://art.state.gov/.